Dr. Usuki is a board certified Radiation Oncologist and Assistant Professor of Radiation Oncology. He earned his Doctorate of Medicine degree from Jefferson Medical College in Philadelphia, PA. He then went on to complete a surgical/transitional internship at the University of Pennsylvania Hospital System in Philadelphia, PA, and then residency in Radiation Oncology at the University of Rochester Medical Center's Strong Memorial Hospital where he served as chief resident. Dr. Usuki's research and primary clinical practice includes patients with primary malignant brain/spine tumors, metastatic lesions to the brain/spine, and benign brain/spine lesions. He particularly focuses on applying cutting edge radiation treatments such as Stereotactic Radio Surgery (SRS), Tomotherapy, Intensity Modulated Radiation Therapy (IMRT), and Image Guided Radiation Therapy (IGRT) to the spine and brain. He also utilizes Stereotactic Body Radio Therapy (SBRT) for liver and lung metastases and other primary tumors. Additionally, he treats patients with gastrointestinal tumors. 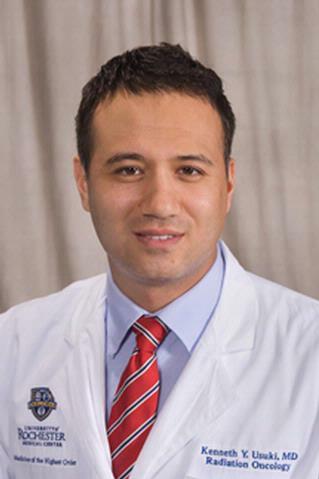 Dr. Usuki is also involved in the education of residents and medical students at the University of Rochester's School of Medicine and Dentistry. Qiu H, Moravan MJ, Milano MT, Usuki KY, Katz AW. "SBRT for Hepatocellular Carcinoma: 8-Year Experience from a Regional Transplant Center." Journal of gastrointestinal cancer.. 2018 Dec 0; 49(4):463-469. Bates JE, Choi G, Usuki KY, Katz AW, Milano MT. "Impact of Right-sided Primary Tumor Location Among Patients With Oligometastatic Colorectal Cancer Treated With Stereotactic Body Radiotherapy." American journal of clinical oncology.. 2018 Dec 0; 41(12):1172-1175. Milano MT, Sharma M, Soltys SG, Sahgal A, Usuki KY, Saenz JM, Grimm J, El Naqa I. "Radiation-Induced Edema After Single-Fraction or Multifraction Stereotactic Radiosurgery for Meningioma: A Critical Review." International journal of radiation oncology, biology, physics.. 2018 Jun 1; 101(2):344-357. Epub 2018 Mar 29.